Connect your satellite communications solutions at a single point! The ComCenter is a feature-rich data and voice solution for the Iridium network. A high-powered, intelligent controller and high-visibility display allow you to configure the ComCenter precisely to meet your needs. RJ11 Connect. Connects to an analog phone (single or PBX) including multi-handset cordless phones. Use of a cordless phone with expandable handsets can provide up to eight units within a two-mile range (unobstructed) from the base station. Hands-Free Connect. Headset/microphone jack offers audio enhancement circuitry to provide excellent voice quality. Data Port Connect. 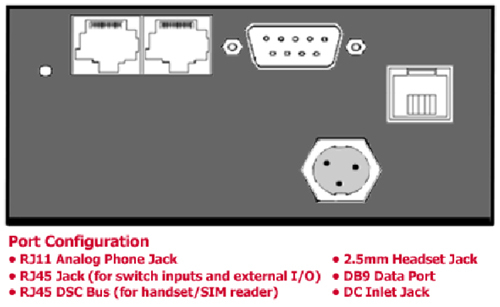 RS232 port for data connections. Compatible with Iridium’s Direct Internet 2.0 and fax adapter. Iridium certified product. Additional approvals and certifications include CE and IEC 60945. "Smart Dialing." ComCenter knows the correct format for the country that is being dialed and places the call once the number is entered. Smart Dialing eliminates the superfluous "00" IDD code (no more international dialing sequence). Clear Controls, Simple Operation. ComCenter has a high-visibility graphical display for setup, troubleshooting, programming, and operation. Base Station Ringer. Audible ringing to alert of incoming calls. Versatile Power Input. 10-32VDC input range supports power systems on most vehicles and vessels. Includes a universal AC/DC power adapter (100 to 240VAC, 47 to 63 Hz), and a DC vehicle cigarette power adapter.